Home » Blog » Your HVAC Vents and Ducts Are No Place for Hiding Valuables! Your HVAC Vents and Ducts Are No Place for Hiding Valuables! 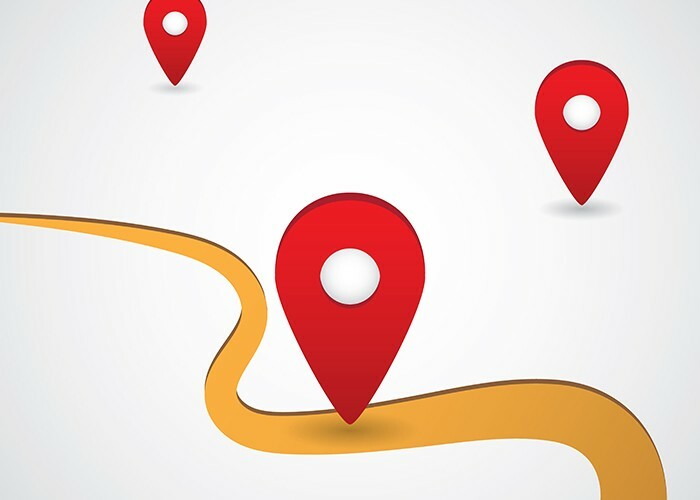 On screen, it seems that the perfect hiding spot for valuables is in a home or building’s ductwork – movie and TV characters always seem to be loosening vent covers and pulling out stacks of cash or diamonds the size of golf balls. As with most things we see in the movies, in the real world it just isn’t the same – while ducts and vents may seem to be the perfect “hiding in plain sight” spots, tampering with your HVAC system in this way could cause unintended damage and put your family in danger. Think your functional vents and ducts would make great hiding places? Think again! Despite the idea’s support from Hollywood as well as countless websites turned up through a quick Google search, your home’s HVAC system should never be tampered with and used as storage. Your home’s duct system is meant to circulate conditioned air throughout your living areas. It was not designed to be used as a secret hiding spot – using it as such has the potential to cause costly damage. Fallen duct runs. Your home’s ducts and their supports were not built to support the weight of Grandma’s heirloom jewelry collection or an arsenal of weapons. Adding extra weight by storing items within the ducts could cause duct straps to break, duct connections to separate, and entire runs to fall apart. When the duct run collapses, the items you were storing within could be damaged, and you will waste energy as your conditioned air pours into the unconditioned areas containing your ducts, rather than your living areas. New supports will be needed and possibly new sections of ductwork. Restricted airflow. Placing items inside your ducts and behind vent covers will instantly restrict airflow through the HVAC system. Repeated removal and reinstallation of vent covers to access and hide items could damage the fins of the vent cover and/or the mechanisms within the cover which will also limit airflow into interior spaces. Airflow blockages will force your heating and cooling systems to expend excess energy in order to move conditioned air into your living spaces, stressing the HVAC equipment to the point of repairable malfunction or a breakdown requiring system replacement. Lost items. In a functional duct system, air circulates throughout the day. Lightweight items such as important documents and cash can be picked up by the airflow and carried through the system; this is problematic not only due to the loss of the items themselves, but where they may end up. Papers may clog the air filter, restricting airflow and preventing filtration; items may come in contact with sensitive components and cause damage. The International Association of Certified Home Inspectors (InterNACHI) warns that using your home’s heating ducts to store valuables may put you at risk of experiencing a house fire. When kept in a heated area, such as heating supply ducts, your items could ignite; instead of protecting a few things, you may be putting your home and your family in great danger. While a long run of ductwork may seem like an ideal place to hide shotguns and the like, InterNACHI warns homeowners never to do so. For everyone’s safety, firearms should be stored in a proper gun safe which is kept locked and out of reach. Gun safes help to keep home occupants safe and also work to deter theft. If you’re still convinced that your stuff is safest behind a vent, there’s a better solution that will prevent damage to your heating and air conditioning ducts: a false vent. Products like the one pictured here are designed to give the illusion of being a boring old return air grille, but with the ability to store your valuables safely inside. You can purchase pre-made false vents, or you can make one yourself. 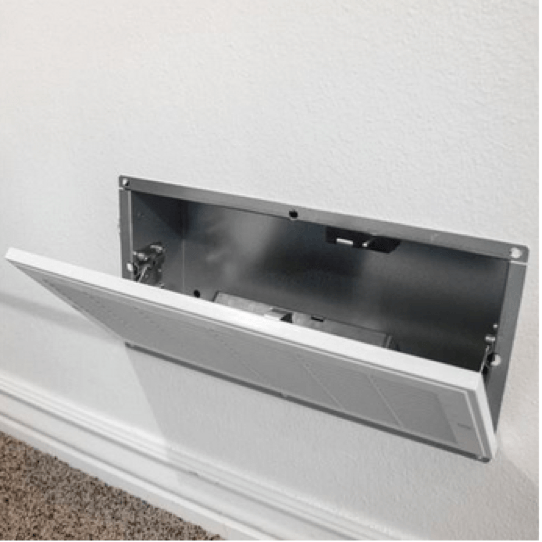 If you choose to go the DIY route, purchase a vent cover that matches the style and color of those already installed in your home – if your false vent stands out, it may be easily identified. A false vent can only accommodate a few small things – what’s a homeowner to do when you need to conceal something a bit bigger? The answer: false ductwork. An extra run of ductwork can be installed in a basement, attic, or other utility space, even alongside functional ductwork. A false duct run can be built to various dimensions, so you can design an enclosure that has the capacity to contain the specific items you wish to hide. When taking personal security advice from on-screen characters, we insist you take your HVAC system safety advice from our pros! Using a false vent or false ductwork will give you the security you seek without damaging the functional ducts and vents which are vital to your home’s heating and cooling system performance. If your home’s ductwork and vents have been damaged, while holding all your valuables or just through normal wear and tear, you’ll need an HVAC contractor to replace or restore them so your heating and cooling systems can operate efficiently and accurately. 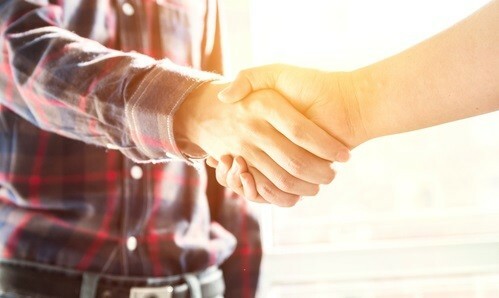 Let us connect you with a trustworthy HVAC company in your area who can assist with this project as well as your household’s overall comfort needs. Learn more by clicking here.